Energy-efficient technology, from new LED lighting to auxiliary solar systems, are becoming more affordable and will help business and residential owners to lower energy installation, usage and maintenance costs with an increasingly smaller initial investment. That was the message conveyed to about two dozen area business owners and otherwise interested attendees at a lunchtime presentation Tuesday, hosted by the Spearfish Economic Development Corporation at the Joy Center at Black Hills State University. 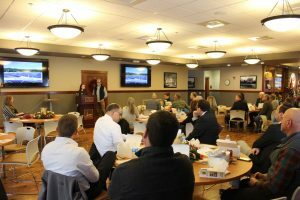 Sara Pesek, governmental affairs manager for GenPro Energy Solutions of Piedmont, said ongoing projects in and around Spearfish demonstrate the growing popularity of LED and solar technology, not just for the cost savings, but also for its environmental friendliness. 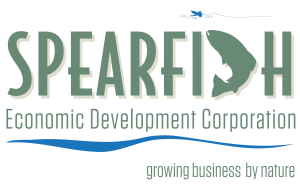 “Spearfish has a culture of sustainability and environmentalism, and that combined with the fact that it’s so economically viable and so profitable right now, really makes it a good place to get started,” Pesek said, after the hour-long presentation. Black Hills State University recently completed a $150,000 project with GenPro to install 240 solar collector panels atop the campus’s newest residence hall, Bordeaux Hall. The panels are capable of producing 69.8 kilowatts of power, estimated to help cut energy costs for the building by an average of 20 percent. Cory Johnson, BHSU energy manager and electrician, said he projects the average yearly savings to exceed 20 percent. Plans are in the works to convert another residence hall to solar in the near future, he said. “We’re going to do as many buildings as we can,” said Johnson. Erika Young, GenPro marketing and external affairs manager, said initial interest in solar energy continues to expand. Projects slated by the company for 2019 will produce 27 megawatts of power. Just a few years ago, that total was less than 1 Mw. “Each day we have more requests coming in for what (solar) could do for their homes, what it could do for their businesses, Young said. Young said ranchers are interested in solar-powered pumps for water wells unreachable by electrical grid supply lines. “It’s an easy, simple solution to install a solar water well,” Young said. The push for energy efficiency is fueled by more than cost savings. Black Hills State has set a goal of carbon neutrality, or removal of as much carbon dioxide from the atmosphere as it puts in, by 2050. “We love all the money we’re saving with these solar projects, but the overarching goal is to make the university the most sustainable it can be,” said Eva Chase, BHSU sustainability coordinator.